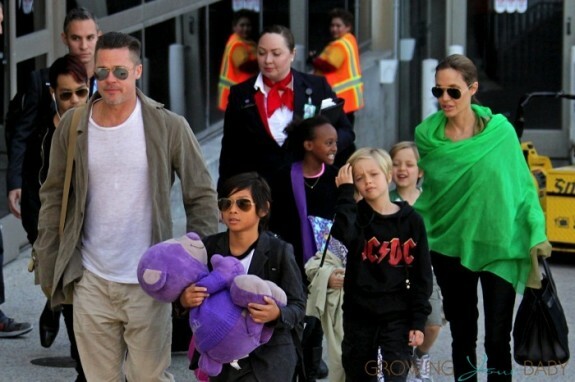 Home » The Jolie-Pitts Touch Down in LA! In a rare sighting Brad Pitt and Angelina Jolie were photographed together with all six of their kids on Wednesday as they departed Los Angeles Airport headed home for the first time in 5 months. Brad led the way with Pax, while Angelina kept the crew together at the back holding Vivienne’s hand. Zahara did double duty by keeping Knox close and pulling her luggage. The family has been in Australia since September while Angelina directed ‘Unbroken’, the story of Louis Zamperini, an Olympic runner who, while enlisted during World War II, survived for 47 days adrift on a raft in the Pacific after a plane crash, before being imprisoned in a brutal Japanese POW camp for over two years. While down under, the kids were often photographed spending time with their dad, paddleboarding, jet skiing and sightseeing. Their projects overlapped slightly while he was finishing up Fury, but for the most part Brad played the stay-at-home dad when Angelina was busy at work. On Monday night the couple celebrated the films completion with the cast and crew at Shipwreck Bar and Grill in Airlie Beach, Queensland, Australia. It must have been a party to plane situation because both were still wearing the same clothes when they arrived in LA. Angelina will now have some downtime before she heads back out on the road to promote Maleficent in May. Vivienne may also be joining her mom as she plays the role of Princess Aurora when she was a toddler in the movie. While speaking at Disney’s D23 Expo in California Angelina revealed that her daughter won the role because she was the only child who wasn’t intimidated by her extreme makeup. “One little kid even said: ‘Mummy, please tell the mean witch to stop talking to me’,” she added.